Captain Ashton ... Safe Landing! We spent 13 hours traveling from home departure to arrival in our condo, so I have few photos. This, however, will rise to the top as a memorable moment for Ashton! On takeoff & landing, the stewardess was in the jump seat across from us, so, sitting facing one another, we struck up a conversation. She has 6 children & only flies one day a month. 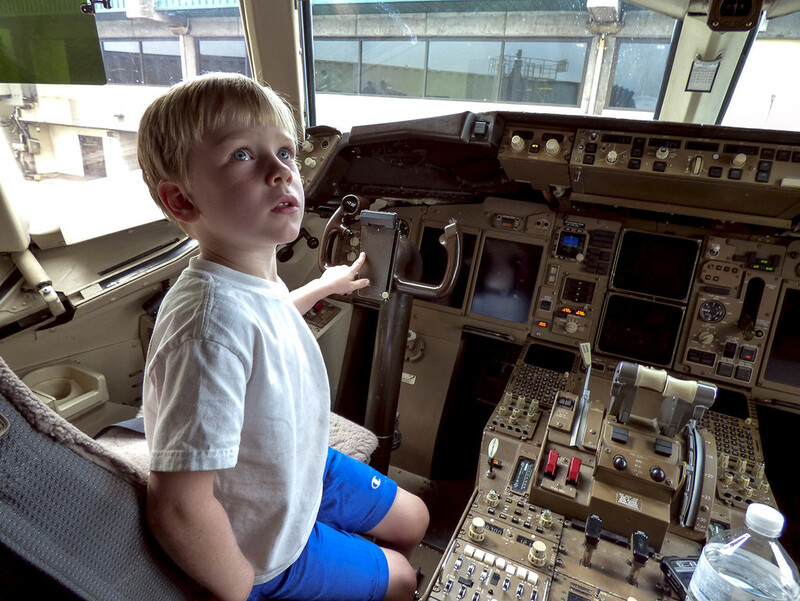 She realized we were traveling with the kids and grand kids, so before landing, I asked if it might be possible to take Ashton into the cockpit. She was totally all for that & brought out a book to read to him about good manners on an airplane...brilliant idea for little ones! As soon as a space had cleared, she called up to "Captain Vince" who welcomed us in, and here, was chatting with Ashton. How nice that was of him...looked like he might be a grandfather, himself. An aside, while talking to "Margie", the stewardess (Flight Attendant for the more PC amongst you), she excitedly told me about carrying a "Flat Stanley" on this trip for a child in Pennsylvania. She brought it out to show me, and I offered to photograph her holding it. She gave me her cell phone and I didn't get *my* picture (Which she later realized and apologized for! ), but this was a far better moment in trade! We each went away happy! Nice day! How cute is this!!! I bet he was thrilled. What a great memory this will be for him in years to come. I'm so glad they still allow kids into the cockpit! Ashton looks in awe of all of the controls. Wonderful shot of your junior captain! Have a blast in Hawaii with your beautiful family!!! excellent! British Airways don't allow this anymore so this is so refreshing. That is such an exciting experience for your precious young grandson. What airline? Sounds like they have an exceptional caring crew. Such a cute photo and one to treasure in years to come. What a wonderful experience for the youngster. I'm sure it's a day he will remember for a long time. What a fabulous experience for Ashton. Next thing you know he'll be wanting to be a pilot when he grows up! @aglennc @peggysirk @kerristephens @danette @salza @aponi Thank you all! Our two grandsons were (surprisingly, to me) the only children on the flight. @nicknac Ken has so many frequent flyer miles on American Airlines, we fly with them all the time. Actually, in the past when I asked if I could take a photo in the cockpit, they had me come sit down & I'm in the photo! It's so nice when they take a few extra minutes out of their busy day to share a love of flight with the next generation! @cimes1 It's American Airlines, and, with the exception of one too-stressed-out stew in years past, we find all the crew to be congenial and helpful. We always sing their praises and recommend them! I know Flat Stanley... a great book ! This is a super shot! This shot captures the wonder and joy of a child. Great shot and glad that you explained what Flat Stanley is, I was feeling like I was the only one that didn't know what it was! A look of wonder and concentration! @Weezilou Aha! Thanks for the explanation, Louise! What a lovely idea! Thanks again for the memories. Lucky Ashton to get to travel with you full size in real life! What a special moment you have captured. I am amazed they let him into the seat of cockpit. So wonderful of this crew! Have a wonderful trip with your family! @allie912 Oh thank you, Allie! I was surprised to see I hadn't posted one while traveling, but hadn't thought to look back at the arrival! @kwiksilver It was a fun time back then Gillian when some-of-us-still-here were just getting to know each other! Well, you just answered a question. A couple were photographing a "Flat Stanley" yesterday and I had no idea what it was. This was an amazing story. A wonderful shot! Your grandson is loving it! So cool. An every boy`s dream. What a lucky young fellow.................he looks very interested in what is being said! Great capture, Louise - they don't that much anymore, for obvious reasons. Very good of the captain to allow this event - I still clearly remember my first time, which I'm almost embarrassed to admit was in a TWA Lockheed Constellation! What a thrill! Wow what a wonderful chance this was to see the cockpit - Ashton will always remember this. Just look at his gorgeous face!! I have never heard of Flat Stanley - I learn so much from following you Louise!! Sweet little one !! Good for him, he will have great memories. What a wonderful experience for your grandson! Glad you explained the Flat Stanley. I thought it was an iron for your hair.